KellyHobkirk.com is now a marketing blog. 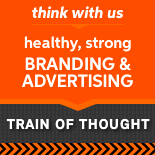 I’ll still be writing about brands and branding primarily on my branding and advertising firm website, trainofthought.net. Inevitable it is that some talk of brands and branding will still be here because marketing and brands are intrinsically tied together, like apple and seeds. This is a blog about marketing, working better, and customer service, for uncommon thinkers and unusual companies.